It has been requested that this article be rewritten. Reason: Poor writing that doesn't meet the standards / Boss section missing. Not to be confused with Super Mario World or Super Mario 3D Land. Super Mario 3D World is a 3D platformer action game for the Wii U, released in November 2013. It is a follow-up game of the Nintendo 3DS installment Super Mario 3D Land, the fifteenth title in the Super Mario series, the seventh 3D Mario title overall, and the fifth 3D Mario title on a home console after Super Mario Galaxy 2. The game builds upon the previous installment, following a similar 3D level-design convention inspired from the 2D platformer titles where players must navigate through a linear-designed level within a time limit to reach a level's flagpole. The game's plot centers around Mario, Luigi, Princess Peach, and Toad having to rescue the rulers of the Sprixie Kingdom, the Sprixie Princesses from Bowser. One key aspect introduced in this title is the simultaneous multiplayer, the first 3D title in the Mario series to incorporate up to four players cooperating with each other to reach the goal, although not the first game in the Super Mario series in general to do that. Additionally, players can select their character from a pool of playable characters prior to starting the game, and each of these characters have their own unique playstyle that gives them advantages and disadvantages over other characters. The game makes use of several Wii U exclusive features, such as tapping blocks with the touchscreen in the GamePad and blowing on the mic to reveal hidden items and blow away enemies. It served Miiverse integration, with the game's unlockable stamps that could be used in Miiverse posts and the Ghost Mii functionality that emulates players replaying levels for other players to view; however, the service was terminated on November 7, 2017, meaning that players can still collect stamps, but they no longer serve any purpose. Also, the Miiverse posts that appeared on the course select screen and when selecting courses disappeared. Various new power-ups are introduced in this title, with the trademark suit being the Cat power-up, which enables characters to perform a melee attack, climb up walls, and leap while midair, as well as the game generally having a cat-based theme. 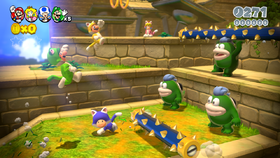 The game introduces a smaller type of levels called The Adventures of Captain Toad, which were later reused and expanded into its own standalone title and prequel, Captain Toad: Treasure Tracker. Bowser captures the Green Sprixie Princess during the game's intro. On an evening in the Mushroom Kingdom, Mario, Luigi, Princess Peach, and Toad come to view and enjoy the fireworks outside of Princess Peach's Castle, when they discover a slanted Clear Pipe along the path. Mario and Luigi fix the Clear Pipe with hammers and wrenches, causing the pipe to eject a large number of items as well as a Sprixie Princess, a fairy-like creature of the Sprixie species. The Green Sprixie Princess begins to explain that Bowser has kidnapped six of her fellow Sprixie Princesses and that she needs their help; thereafter, however, Bowser emerges from the pipe and traps the princess inside a bottle before disappearing back down the pipe with her. Peach, in trying to stop Bowser, falls down the pipe herself, and the others soon follow in order to assist her. The heroes soon end up in the Sprixie Kingdom, where the journey mainly takes place. After going through six worlds, the group encounter Bowser in World Castle, where he is keeping the Red Sprixie Princess; the only Sprixie Princess whom has not been saved yet. After the group successfully defeats Bowser, the Sprixie Princess is saved. However, the celebration is cut short by Bowser surprisingly returning, capturing all seven Sprixie Princesses in a large bottle, and escaping to World Bowser: a theme park modeled after the Koopa King. The heroes make their way through this world, and encounter Bowser again in The Great Tower of Bowser Land. Here, Bowser makes use of a Super Bell, turning into Meowser, and initiating the final battle. The group manages to defeat Meowser after climbing the tower, and rescue all of the Sprixie Princesses. Now safe from Bowser, they thank the heroes as they go through a Clear Pipe back to the Mushroom Kingdom. Mario, Luigi, Toad and Princess Peach all running in Really Rolling Hills. Super Mario 3D World is a linear 3D platform game with gameplay similar to the 2D games. The player must navigate through levels, defeating enemies and collecting power-ups on the way. The player clears a level by reaching the Goal Pole at the end before losing a life or running out of time. The player can store collected power-ups in the item storage, allowing them to be collected by pressing . The player can also collect Green Stars and Stamps, which allow the player to unlock certain levels or can be used in in Miiverse posts, respectively. Points are earned by collecting items and defeating enemies, and are used to determine the player's high score in a level. The player completes the main game when they clear World Bowser and completes the entire game when all bonus worlds are complete and all Green Stars and Stamps are collected. Players' score results at the end of a stage. This is shown when there are at least two active players after a course has been cleared. For the first time in a 3D Super Mario title the game supports up to four-player simultaneous multiplayer, allowing players to control Mario, Luigi, Princess Peach, Toad, and Rosalina; additional players can drop in at any time by pressing / , and can drop out by pausing and pressing on the pause menu, similar to New Super Mario Bros. Wii and New Super Mario Bros. U; in this game, however, players can also switch characters before entering a stage. Each character has different abilities, much like they had in Super Mario Bros. 2. The multiplayer works similarly to New Super Mario Bros. Wii and New Super Mario Bros. U, in that players can enter a bubble at any time, pick each other up and throw each other, bounce on each others' heads, and so on. Players also share lives when playing in multiplayer, rather than each player having a separate life counter. The game uses a cooperative and competitive multiplayer system; each player works together to get to the end of the stage, but is ranked based on points earned out of the total score at the end. The player that scores the most points for one stage receives a crown, which can be stolen by the other players and gives the player wearing it at the end of the stage a score bonus. In addition to being the default player one controller, the can be used at any point during gameplay (multiplayer or not) to interact with the environment, allowing players to stun enemies, momentarily reveal hidden objects (both in levels and on the map), hit blocks, stop moving platforms, and various other functions, similar to the Co-Star Luma from Super Mario Galaxy 2 and Boost Mode from New Super Mario Bros. U. The can also be used to control the camera during gameplay by pressing the button on the bottom corner of the GamePad screen and tilting the controller, in what is known as Free Camera Mode. It works in a similar fashion to the camera from Super Mario 64 and Super Mario Sunshine. The GamePad can also be used for Off-TV Play at any point. Super Mario 3D World features Nintendo Network support in the form of Miiverse integration and Ghost Miis. These features are first enabled on a given save file after progressing a bit into the game. With Miiverse, players could make a post at any point on the World Map or after completing a stage by tapping the "Post" icon; other players' posts could also be viewed on the World Map by walking up to their Miis and pressing / , or on the top of the stage results screen. Ghost Miis are created after the player clears a course without losing a life, and they perfectly recreate the player's movements throughout the course, automatically distributing them to other players. Players who receive the data can play through an already cleared course with three Ghost Mii characters. While traveling through a course, the Ghost Mii characters occasionally carry gifts behind them that when caught can contain various items. The Nintendo Network settings for this title can be changed at any point by pausing the game and selecting the Nintendo Network icon button. Super Mario 3D World plays very similarly to Super Mario 3D Land, being a 3D platformer with gameplay similar to the 2D games. This game retains its predecessor's similarity to Super Mario Bros. 3 (with colorful blocks, the Super Leaf, Spikes and the Lose a Life theme returning from that game); many elements from Super Mario World return as well, such as Chargin' Chucks and Kuribons, now with an official English name, Galoombas. Stages are once again open yet linear, have a time limit, and end by grabbing the classic Goal Pole at the end. Green Stars return from the Super Mario Galaxy games, taking the role of the Star Medals from Super Mario 3D Land. There are also various stamps that the player can find. There is one in each level and they can be used in Miiverse posts. The game also seems to be slightly more puzzle-focused than its predecessors. The path from the start of the level to the goal is no longer a straight shot, and the players would often have to use certain power-ups and items in order to find the way ahead. Additionally, the game also features a score system, the first time one has appeared in a 3D Mario game. Mario and co., in their Cat suits, confronting Spikes. Power-ups, like the Fire Flower and Super Leaf, make a return, along with almost every item from Super Mario 3D Land (excluding the Statue Leaf and P-Wing). The Mega Mushroom from New Super Mario Bros. also makes an appearance. There are also several new power-ups and suits; The most prominent of the new power-ups is the Super Bell, a power-up that grants the player a Cat Suit, allowing them to lunge at and claw enemies and climb up walls. Main article: Mario Bros. (game) § Luigi Bros. The title screen to Luigi Bros., a remastered port of Mario Bros.
As part of the Year of Luigi celebration, also included is another game that can be accessed from the title screen after beating the main game once (or immediately if New Super Luigi U save data is present). The game, titled Luigi Bros., is a modified ROM of Mario Bros., but with Luigi as the only playable character. The game can be accessed by touching the Luigi button found in the bottom-left corner of the screen. As it is a modification of the original NES game, it makes use of the Virtual Console interface and allows the use of save/restore points. Also, similar to New Super Luigi U, multiple 8-bit Luigi sprites can be found throughout the game. 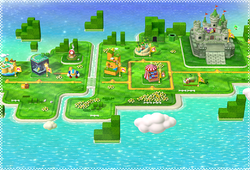 The game features a large world map, consisting of 8 worlds, in a similar vein to Super Mario Bros. 3, with 4 unlockable bonus worlds. Each world is connected by Clear Pipes. Unlike previous games, where players follow a simple path through the maps, the map here can be freely roamed with full control of the characters, except with a limited jump. Each world features a set of levels along with Enemy Battles, Toad Houses, Sprixie Houses, Lucky Houses, and either Mystery Houses or a puzzle-focused series of levels called "The Adventures of Captain Toad" with Captain Toad playable. The maps also contain items such as coins and 1-Up Mushrooms and other secrets. When the player finishes a course with all Green Stars, the ball ornament on the flagpole will be replaced with a Green Star, which can even become gold when the stage is cleared with all five characters, the stamp from that stage is collected (if any), and at least one character touches the top of the flag at the end of the stage. Upon reaching World Crown, the player can also see which stage has been cleared with which characters on the Map Progression screen or when approaching a stage. When all the stages in a world have been cleared with every character, a paw print mark will be shown on the upper-right corner of the Map Progression screen. World 2 A desert-themed world, where the Yellow Sprixie Princess is captured. The boss is Boom Boom. World 3 An ice-themed world, where the Blue Sprixie Princess is captured. The first boss is Pom Pom, and the second boss is Hisstocrat. World 6 A cloud-themed world, where the Cyan Sprixie Princess is captured. The first boss is a second encounter with Boom Boom, and the second boss is Motley Bossblob. World Bowser The eighth and final world, which is a large amusement park modeled after Bowser. Prior to the player arriving at this point in the game, they encounter news that Bowser makes a surprise return at the end of World Castle, and captures all seven Sprixie Princesses again; they are now being held hostage in this world. The first three bosses are Pom Pom, Queen Hisstocrat, and Motley Bossblob, and the final boss is a final encounter with Bowser. World Star The first bonus world with Lumas and Star Bits. Rosalina is found in the second level in this world. World Mushroom The second bonus world. These worlds contain levels from previous worlds, with a twist, such as making it a night level or a speed run. There are no stamps in these worlds. World Crown The final bonus world. 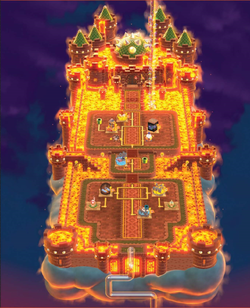 This is the shortest world in the game, containing one main level (Champion's Road), a Captain Toad level (Captain Toad's Fiery Finale), and a Mystery House containing 30 Green Stars (Mystery House Marathon). This world also contains the last Sprixie House, where the player can obtain a stamp of a pixelated Luigi. Sprixie Princess Sprixie Princesses rule the Sprixie Kingdom and are captured by Bowser at the beginning of the game. At the end of every world, the player rescues a Sprixie Princess and it builds a Clear Pipe to the next world. After World Castle, Bowser captures all the Sprixie Princesses again, but they are rescued permanently when the player defeats Meowser in World Bowser. Sprixie Sprixies are fairy-like creatures that are ruled by Sprixie Princesses. They appear in many levels and hold binoculars, allowing the player to see the end of the level. They are also found in Sprixie Houses. Luma Lumas make a minor appearance as non-playable characters. They can be found floating around the map in the bonus worlds. The player cannot interact with them. Plessie Plessie is a character that the player can ride across water. The player must tilt to move or accelerate. The player can press to jump. It functions similarly to Dorrie from Super Mario 64 and Manta Ray from Super Mario Galaxy. Rabbit Rabbits can be found in several levels, where they run from the player. When caught by the player, they release power-ups, Coins, or Green Stars. Mega Rabbit Similar to normal rabbits, they try to run from the player and must be caught. These rabbits release Mega Mushrooms or Green Stars. Toads Toads appear in and host Toad Houses, where the player can win power-ups. Fire Bar Fire Bars are rotating sticks with fireballs on them. Fort Fire Bros. Fighter Fly Fighter Flies are bouncing fly-like enemies in the Luigi Bros. minigame. Luigi Bros.
Shellcreeper Shellcreepers are Koopa Troopa-like enemies. They are the simplest enemies that appear in the Luigi Bros. minigame. Luigi Bros.
Sidestepper Sidesteppers are crab enemies that appear in the Luigi Bros. minigame. They require two hits to be immobilized. Luigi Bros.
Cat Mario The Super Bell is a golden bell that transforms Mario into Cat Mario. This allows him to climb walls and the Goal Pole and pounce at enemies. He can also attack enemies that he stands near. Double Mario The Double Cherry is a set of cherries that transform Mario into Double Mario. An identical clone of Mario will appear. This allows the player to activate certain switches or defeat more enemies. Lucky Cat Mario The Lucky Bell is a bronze bell that transforms Mario into Lucky Cat Mario. This form functions identically to Cat Mario, with the added feature of transforming into an invincible golden statue when ground-pounding. This allows him to collect many coins and defeat most enemies that cannot otherwise be defeated. It begins appearing in World Mushroom. Super Mario Collecting the Super Mushroom transforms the player into Super Mario, making them bigger and allowing them to take a hit from an enemy without immediately losing a life. This is the default form of Mario. Fire Mario Collecting the Fire Flower transforms Mario into Fire Mario. This allows him to throw fireballs to defeat enemies. Boomerang Mario When Mario collects the Boomerang Flower, he gets a blue Koopa shell and can throw boomerangs to collect items or defeat enemies. Tanooki Mario When the player collects a Super Leaf, they transform into Tanooki Mario. This allows them to float through the air for a short time and whip enemies with their tail. White Tanooki Mario When the player dies more than five times in a level, an Assist Block appears, containing an Invincibility Leaf. When it is collected, he functions exactly like Tanooki Mario, but with the added feature of being invincible. If this leaf is collected, the stars on the player's save file will not sparkle. Mega Mario When the player collects a Mega Mushroom, they become very large and can defeat most enemeies and destroy most objects by touching them. He can also ground-pound to create a shockwave that can defeat nearby enemies. Invincible Mario When the player collects a Super Star, they become invincible and can run faster for a short time and can defeat almost any enemy they touch. In multiplayer mode, they also share the power with any character they touch.
? Box ? Boxes are types of ? Blocks that can be worn by the player. When the player walks, they will collect coins. Cannon Box Cannon Boxes are created when certain ? Blocks are hit. When worn, they continually shoot cannonballs that can defeat enemies or destroy objects. If the player holds / / / , the cannon can be charged, allowing the ball to travel farther. Green Shell Green Shells are shells originally from Koopa Troopas. If the player crouches while holding one, they will enter the shell and can scoot around for a few seconds, defeating enemies and bouncing off walls. The shell will change color to match the player. Goomba Mask When the player wears a Goomba Mask, Goombas and Goomba variants will not attack the player, though other types of enemies still will. When the player jumps, a Goomba sound effect can be heard. Light Box Light Boxes are wearable blocks containing light bulbs. They are found mainly in Ghost Houses and can be used to defeat Boos and Boo variants. Light Boxes will change color to match the player. Piranha Plant These are a potted variation of Piranha Plant that the player can hold. They will eat enemies they come in contact with and will collect items. They will also attack other players in multiplayer mode. Propeller Box Propeller Boxes can be worn by the player and allow the player to fly for a short time. The box changes color to match the player. Ice Skate Ice Skates are items based on Goomba's Shoes. They are found with Goombas in them and can be worn by the player to skate across ice. The player will defeat enemies they run into. 1-Up Mushroom When collected, 1-Up Mushrooms grant the player an extra life. + Clock + Clocks add either 10 seconds or 100 seconds to the timer. Blue Coin Blue Coins are coins that appear from a P Switch. They function the same as regular coins. Coin Collecting 100 Coins grants the player an extra life. Coin Ring Coin rings are found in Plessie levels and grant the player three Coins when passed through. Coin Stack Coin Stacks are stacks of several coins that can be collected. They give the player many coins at once. Green Star Green Stars are used to unlock some levels. There are three per level, and all must be collected for 100% game completion. Stamp Stamps can be collected and used in Miiverse posts. There is one per level, and all must be collected for 100% game completion. Cat Wheel Cat Wheels are wheels that spin when attacked by Cat Mario. They usually raise platforms or reveal secret areas. Character Switch Character Switches are switches that can only be activated by the character depicted on them. They reveal Stamps, Green Stars, and Coins. Color Panel Color Panels are found in bonus areas and light up when stepped on. When the player steps on all panels in an area, a Green Star appears. Green Coin Green Coins appear after a Green Star Ring is activated. When all eight are collected before the time runs out, a Green Star appears. Green Star Ring When a Green Star Ring is passed through, Green Coins appear. Key Coin When five Key Coins are collected, a Warp Box appears. P Switch P Switches are switches that release balls in bonus areas or reveal blue coins. Red Coin Red Coins appear when the player passes through a Red Ring. When all eight are collected, the player receives a power-up. Red Ring Red Rings reveal Red Coins when they are passed through. Switch Panel Switch Panels change colors when stepped on. When all panels in an area are changed to yellow, a path opens or a Green Star appears.
? Block ? Blocks contain power-ups or coins, which are released when the block is hit or ground-pounded. Assist Block Assist Blocks contain the Invincibility Leaf. They appear after the player loses several lives in a course. Beep Block Beep Blocks are platforms that appear and disappear at a time interval. The player must jump at the correct time to avoid falling. Big Block Big Blocks are larger variations of Brick Blocks. They must be hit five times to be destroyed. Brick Block Brick Blocks are blocks that the player can destroy. They are usually empty, but may contain items. Crate Crates are wooden boxes that act as obstacles. Dash Panel Dash Panels are pads that, when walked on, make the player travel at fast speeds for a short time. Donut Block Donut Blocks are platforms that slowly fall when stepped on. Lift Lifts are platforms that rise and fall. They are used to reach locations at a higher elevation. Multi-Vator Multi-Vators are Lifts that are activated when stood on by a certain number of characters. Mushroom Trampoline Mushroom Trampolines are bouncy platforms with a mushroom appearance. POW Block POW Blocks are blocks that cause a shockwave that defeats all enemies and breaks all blocks on screen. Red-Blue Panel Red-Blue Panels are tiles that flip when the player jumps. Rock Block Rock Blocks are gray Big Blocks that are more difficult to destroy. Roulette Block Roulette Blocks scroll items in a roulette and release the item that was onscreen when the block was hit. Switch Block Switch Blocks change the direction of or reveal new Switchboard paths. Springboard Springboards appear when Hop-Chops are defeated. They are used to reach heights. Switchboard Switchboards are platforms that move in the direction of the arrow the player stands on. Touchstone Touchstones are platforms that change position when touched on the Wii U GamePad. Baseball Baseballs can be thrown to defeat enemies. Bomb Bombs are inactive Bob-ombs that light their fuses when picked up. They can be used to destroy objects. Gold Shell Gold Shells are Koopa Troopa shells that give coins when they move, similar to ? Boxes. Kick Bomb Kick Bombs are bombs used to defeat Bowser. Snowball Snowballs can be thrown to defeat enemies. Clear Pipe Clear Pipes are a type of Warp Pipe. The player can enter one to travel from one place to another. Clear Pipe Cannon Clear Pipe Cannons are cannons that shoot the player to another part of a level. They can also be found as Cloud Cannons, which shoot the player to Coin Heaven. Mystery Box Mystery Boxes are Warp Boxes that warp the player to a bonus area. Warp Box When entered, Warp Boxes teleport the player to another area of a level. Warp Pipe When entered, Warp Pipes teleport the player to another area of a level. Board The Board is a wooden cutout of Bowser that can be knocked down when interacted with. Checkpoint Flag Checkpoint Flags appear midway through a level and save the player's progress, allowing them to restart from the flag if they lose a life. Goal Pole Goal Poles are flagpoles found at the end of every level. Touching one completes the level. Like with New Super Luigi U, Super Mario 3D World features 8-bit Luigi sprites hidden in various parts of the game, not just restricted to levels. It has been requested that this article be rewritten and expanded to explain the game's development in detail (tagged on June 30, 2018). According to Koichi Hayashida, early in development Peach was planned to reprise her role as damsel-in-distress. However, Yoshiaki Koizumi suggested to the development team that she should instead be a playable character, akin to Super Mario Bros. 2. Super Mario 3D World ended up being the first, and so far, the only 3D Mario platformer in which Princess Peach is playable and not kidnapped. 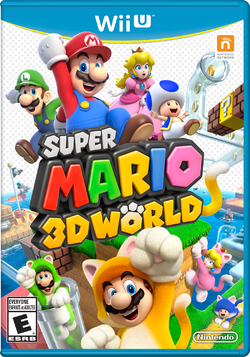 Super Mario 3D World received widespread critical acclaim and has been praised for its gameplay, visuals, music, level design, the Cat form's usefulness, and its improved 4-player co-op compared to New Super Mario Bros. Wii. However, it has been criticized for camera issues and co-op control issues. The game currently has a score of 93 on Metacritic based on 83 reviews and a score of 92.56% on GameRankings based on 54 reviews. Mark Walton, reviewing for GameSpot, called the game an "exceptional craft" with "painstaking focus on the minute details that are integral to making it feel special." He also added that "[every one of the game's levels] is a golden nugget of heavenly platforming joy, where ideas are rarely repeated--and if they are, they're given such a twist as to make them feel new again." Jose Otero of IGN gave the game a 9.6 out of 10, commenting that, "After 28 years of making marvelous Mario platform games, you'd think Nintendo would run out of ideas. But Super Mario 3D World defies such logic and creativity sets itself apart-in good ways-from its outstanding recent predecessors." Chris Carter, reviewing for Destructoid, called it one of the greatest Mario games ever made and gave it a 10 out of 10, stating, "Why is 3D World so good? Because it's essentially a complete refinement of everything that was great about 3D Land, a game that I happen to think is criminally underrated. 3D World is pretty much a joy ride from start to finish--and that "start" is as quick as ever." Adam Cook from God is a Geek scored the game as a 100, saying, "Unimpeded creativity drips from every moment, forcing an awed expression from the most cynical of mouths. Decades old ideas are renewed with such ease and simplicity that it’s almost unnerving. I’ve fought Bowser more times than I can even remember, yet the first encounter somehow feels fresh. There’s always a princess, there’s always another castle, Bowser is still involved (this time he’s stolen Sprixies and locked them in jars) – it’s the design and execution of it all that makes it so special." Jose Otero, IGN 9.6/10 "Super Mario Galaxy 2 successfully iterated on one of the most inventive platformers of the last console generation. Super Mario 3D World takes slightly smaller steps in the grand scheme of the platformer genre, but it fulfills the promise of a multiplayer Mario much better than anything that the Japanese game maker has done before. Super Mario 3D World is marvelous, and its constant variety and fantastic light-hearted co-op play proves that Nintendo still knows exactly how to tweak the Mario formula in fun ways." Mark Walton, GameSpot 9/10 "Super Mario 3D World is a game of exceptional craft, of painstaking focus on the minute details that are integral to making it feel special. The pace at which you're thrown from one ingenious concept to the next as perspectives, tempos, and mechanics change would choke a lesser game, but here it's done with a seamlessness that makes such rapid inventiveness look easy. This is a game where every level is a golden nugget of heavenly platforming joy, where ideas are rarely repeated--and if they are, they're given such a twist as to make them feel new again." Thomas Whitehead, Nintendo Life 10/10 "Super Mario 3D World can be easily summarised — it’s a terrifically enjoyable, tight and impeccably structured experience. It recalls the mascot’s 3D heritage while providing the perfect starting point for those that prefer 2D platforming, catering to an audience of beginners and skilled veterans alike. Nintendo’s also mastered Mario multiplayer for, arguably, the first time; it’s still manic and can be either co-operative or competitive, but there’s also a sense of space that allows determined groups to progress coherently. This is a definitive 3D Mario experience, successfully finding a middle-ground between the iconic Super Mario 64 and Super Mario Galaxy. You may not swing Bowser by his tail or run upside down, but it’s bursting with creativity nonetheless, while delivering on the craft and skill that defines the Tokyo EAD studio. It’s unmissable." Danielle Riendeau, Polygon 90/100 "Super Mario 3D World doesn't reinvent the Mario formula. But it is in every way its own game, with a bright, joyful aesthetic that's supported by inspired level design and a cast that matters. It gets the balance right between nostalgic touches and clever new twists, and never once let me down with a boring boss or too-familiar retread. In all my years of playing with the Mario gang, I've never been quite so happy to hurl myself into the unknown, and 3D World delivers challenge, surprise and joy in almost every moment." As of March 31, 2018, Super Mario 3D World is the second-best selling game for the Wii U, selling 5.78 million units worldwide. For this subject's image gallery, see Gallery:Super Mario 3D World. Mario, Luigi, Princess Peach and Toad. One of the seven Sprixie Princesses. Key visual showcasing the entire Sprixie Kingdom. The game's official original soundtrack, "Super Mario 3D World Original Sound Track" has been released to Club Nintendo members in Japan, Europe, and Australia, and has been performed by the Mario 3D World Big Band. The game producer is Yoshiaki Koizumi, and the game direction is done by Koichi Hayashida and Kenta Motokura. The main characters' voices are done by Charles Martinet, Samantha Kelly and Laura Faye Smith. General game production is done by Satoru Iwata and Shigeru Miyamoto. Early concept artwork reveals that Cat characters were going to have five fingers, and that Princess Peach's Cat Suit was going to incorporate her brooch. The levels shown off in the E3 demo also have different world and number placements than the final game. Additionally, several sound clips were changed to brand new ones when they were reused ones from previous games in the demo, and several pieces of music were changed to being orchestrated in the final product. The glitch only occurs when the player is Small Toad. If while holding the snowball the player performs a Long Jump, Toad will be pushed backwards. Super Mario 3D World - The game's main theme; first heard in the E3 2013 trailer. Super Mario 3D World - Champion's Road Theme, the Gusty Garden Galaxy Theme Remix. Mario Bros.: There is a bonus game starring Luigi available on the title screen, called Luigi Bros. It is played similarly to this game, except both playable characters are Luigi. Also, the big POW Block on the very top of The Great Tower of Bowser Land must be hit multiple times, getting flatter every time it's hit, just like it does in Mario Bros.
Super Mario Bros.: Some levels have tiles that resemble the ground tiles from this game. The main theme from Super Mario Bros. is covered for bonus areas and Coin Heavens (whose theme comes from Super Mario 3D Land). An 8-bit Luigi sprite from this game can be seen swimming in the background in Bowser's Highway Showdown. Additionally, Beep Block Skyway has an 8-bit Luigi, Coin and Super Mushroom sprites moving along the walls of the stage. Likewise, all of the Luigi sightings are based on his sprite from this game. In addition, the bonus area in Bob-ombs Below resembles Mario's 8-bit sprite from the game. After Bowser gets defeated in his regular boss battles, the bridge beneath him collapses, much like the castle bosses from this game. The Legend of Zelda: Link's 8-bit sprite from the game can be found in the secret area of Rainbow Run. Yume Kōjō: Doki Doki Panic: The player is required to beat all levels with all of the characters (Mario, Luigi, Peach, Toad, and Rosalina, the last one being a secret character) in order to unlock all the stamps and all five profile stars, mirroring how it was required that all characters in the game beat all the levels to unlock the true ending. Super Mario Bros. 2: Mario, Luigi, Peach, and Toad are playable characters. The Mario Bros. and the Princess's abilities are based off of theirs from this game, as well as Toad's speed advantage. In addition, Toad having blue spots is possibly a reference to Toad in the original NES version of this game, in which his sprite appears blue. Doors have the same design and color. A cover of the character select music from this game plays in the casino slot minigame , as well as in the Coin Bonus areas of the game. Rocket Ships make an appearance. The two game's stories are also similar, with Mario, Luigi, Princess Peach, and Toad going to another land and saving it from an evil villain in both games. Super Mario Bros. 3: Like its predecessor, Super Mario 3D World shares some similarities to this game. The death jingle is a cover of that from this game. Tank levels return from this game. In American and some European versions of the game, when first visiting a Toad House, the Toad will instruct the player to "Pick a box. Its contents will help you on your way. ", which is a direct quoting from this game's Toad Houses. Super Mario World: Chargin' Chucks and Galoombas return, and in the case of the former enemy, use the same sound effects for running and being defeated as in this game. Trampolines also use the same sound effect as in this game. The Beach Koopa artwork is also reused as a Stamp. Hitting the Bowser Mobile at the beginning of The Great Tower of Bowser Land occasionally causes Super Mario World sound effects to play. Super Mario Kart: The level Mount Must Dash contains Dash Panels, asphalt, and blocks that reference the Mario Circuit courses from this game. Also, the music is a cover of that heard in the Mario Circuit courses from that game as well. Mario Paint: The Cat Goombas make a similar meow to the cat notes from this game. Super Mario Land 2: 6 Golden Coins: Bowser uses a Super Bell and Double Cherries in the same way Wario used a Carrot and a Fire Flower in his battle with Mario. Super Mario 64/Super Mario 64 DS: In levels when players are riding Plessie, the music that plays is a cover of the one that plays in Rainbow Ride, Tick Tock Clock, and The Princess's Secret Slide from this game. 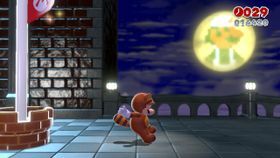 In Shifty Boo Mansion, the first Green Star is found by jumping into a painting, similar to how Mario enters paintings in this game and its remake. When the player catches a rabbit, the rabbit will give an item to the player, similar to how the rabbit gives Mario an item right after getting grabbed. Super Smash Bros. Melee/Super Smash Bros. Brawl: There are two Mystery Houses named Mystery House Melee in World 2 and the one in the later World Mushroom named Mystery House Brawl. Their objectives are to defeat all enemies to advance and go forth. This is a reference to both Super Smash Bros. Melee and Super Smash Bros. Brawl. Super Mario Sunshine: Characters can do a spin jump similar to the one in this game. New Super Mario Bros.: The player can jump on Koopa Troopas to steal their shells and ride in them, similar to the Blue Shell power-up. Super Princess Peach: The theme for Super Bell Hill has similarities to this game's Ladida Plains music. Super Mario Galaxy/Super Mario Galaxy 2: Green Stars make an appearance, replacing Star Medals from Super Mario 3D Land. Captain Toad returns and the levels where Captain Toad is playable contains the Toad Brigade theme from the Super Mario Galaxy games. There are secret underground rooms where the player can collect sequences of Coins for a limited time and receive a prize if all Coins are collected. Rosalina's special ability is the Star Spin attack. Rosalina's emblem is a Grand Star. Super Galaxy, a stage based off of the Super Mario Galaxy games appears, and so do Octoombas, Fizzlits and the Comet Observatory. The Comet Observatory theme (3rd version) plays in the World Crown map area, while a cover of Gusty Garden Galaxy's theme can be heard in Honeycomb Starway, Honeycomb Skyway and Champion's Road. The final boss themes (and the Meowser defeated fanfare) have portions of the themes for the Battlerock Galaxy, Bowser's Galaxy Reactor, and Bowser's Galaxy Generator. The overworld map of World Star has Star Bits in the background. Also, Grumblumps have a similar appearance to Rhomps. The Beat Block mechanic returns under the name "Beep Block", and the Beep Block stages return to the "beep-beep-beep-switch" rhythm as in Super Mario Galaxy 2 with the same tempo as the Beat Block Galaxy theme as well. There is additionally a level called Boss Blitz; this is in reference to the Boss Blitz Galaxy. New Super Mario Bros. Wii/New Super Mario Bros. U: The abilities to do a simultaneous Ground Pound with multiple players, pick up other players, and place their character in a bubble make a return. Assist Play is similar to Boost Mode from the latter game in that the player can stop/hinder enemies with the GamePad, as well as pause stage obstacles like the rolling hills. In Snowball Park, the night-time setting with the background aurora mirrors Spinning-Star Sky. Fire Toad's colors are exactly the same as Fire Yellow Toad's colors from these games. Super Mario 3D Land: The installment is the follow-up game of this title, and thus has some similarities to said game. Many of this game's music is reused or remixed, and a cover of the jazz variation of the main theme plays in Super Block Land. The snow theme and castle theme return in this game, but they are now orchestrated. The base beat and some tunes of the music in Simmering Lava Lake is similar to the music that plays in World 8-5 and World 8-Bowser: Part 2 in this game. Warp Boxes, Mystery Boxes, Peepas, Coin Coffers, Goomba Towers, Stingbies, Biddybuds, and Para-Biddybuds all return. The levels in World Mushroom and World Flower are similar to the levels in the Special Worlds from this game. Mario Kart 7: Princess Peach's portrait from this game, located in Sherbet Rink, is reused. New Super Mario Bros. 2: There are multiple levels/rooms that contain hordes of Coins, like the secret Coin Express stage, Conkdor Canyon Coin vault, and other various locations. Also, three bonus worlds are called World Star, Mushroom, and Flower, just like the bonus worlds in this game. Golden Koopa Troopas and wearable ? Blocks return in Golden Warp Pipes. Mario Kart 8: The Piranha Plant returns as an item. Stamp images are reused in N64 Rainbow Road's fireworks. Stamps can also be collected in this game. The Double Cherry appears as an ad in Toad Harbor. There is a DLC cup named the Bell Cup, which has a course called Super Bell Subway. Cat Peach also appears as a playable character. Mario Kart 8 Deluxe: The crown mechanic in Battle Mode is similar to the mechanic in multi-player of Super Mario 3D World, where the player with the highest score from one stage will be wearing a crown in the next stage. Captain Toad: Treasure Tracker: The game is a spin-off title based around the The Adventures of Captain Toad levels which originated from this game. Several elements from this game also return, including music. Super Bell Hill, Shadow-Play Alley, Clear Pipe Cruise, and Conkdor Canyon return as stages in the Wii U version. The ending cutscene of the Wii U version also reveals that Captain Toad: Treasure Tracker is a prequel to this game. Super Smash Bros. for Nintendo 3DS / Wii U: Peach and Rosalina's red costumes are based on their Fire forms in Super Mario 3D World. Super Smash Bros. for Wii U: Several pieces of music from this game appear, and the Toad trophy refers to Captain Toad's inability to jump. Super Mario Maker: Cat Mario and Cat Peach appear as Mystery Mushroom costumes, with their voice clips being recycled from this game. Super Mario Odyssey: Several sound effects and voice clips from this game are reused. When RoboBrood is defeated, the Broodals appear as fireworks in the sky similar to when Bowser is defeated in The Great Tower of Bowser Land. Ty-Foos and Parabones reappear as enemies, as do Chargin' Chucks with their design from this game. Captain Toad's design from this game is reused. The sprites of Cat Mario and Cat Peach from Super Mario Maker appear in various Kingdoms. Super Mario Maker 2: A theme based on this game can be used. Enemies such as Ant Troopers and Piranha Creepers also appear. 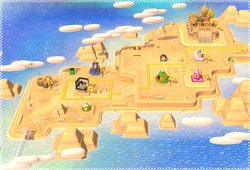 Levels from Super Mario 3D World such as Super Bell Hill, Conkdor Canyon, and Gargantuan Grotto appears in the background of certain themes in the game. If one counts the support items, Super Mario 3D World has the most traditional power-ups in any Mario platformer thus far, with eighteen power-ups (compared to Super Mario Bros. 3, which has nine). The character icons from this game (with the exception of Rosalina and Captain Toad's icons) are used in Club Nintendo prizes. If one looks closely, the plants dance to the background music, changing animations based on a part of the song. Oddly, the Spin Jump move is not mentioned in the game's instruction booklet. The full version of the Super Bell Hill theme. ↑ Gallaway, Brad (February 19, 2014). Super Mario 3D World Review GameCritics. Retrieved April 10, 2017. ↑ Metacritic score of Super Mario 3D World. Metacritic. Retrieved April 10, 2017. ↑ GameRankings score of Super Mario 3D World GameRankings. Retrieved April 10, 2017. ↑ Walton, Mark (November 19, 2013). GameSpot GameSpot. Retrieved December 21, 2017. ↑ Otero, Jose (November 19, 2013). IGN IGN. Retrieved December 21, 2017. ↑ Carter, Chris (November 19, 2013). Destructoid. Retrieved December 21, 2017. ↑ Cook, Adam (November 19, 2013). God is a Geek. Retrieved January 1, 2018. This page was last edited on April 3, 2019, at 16:51.